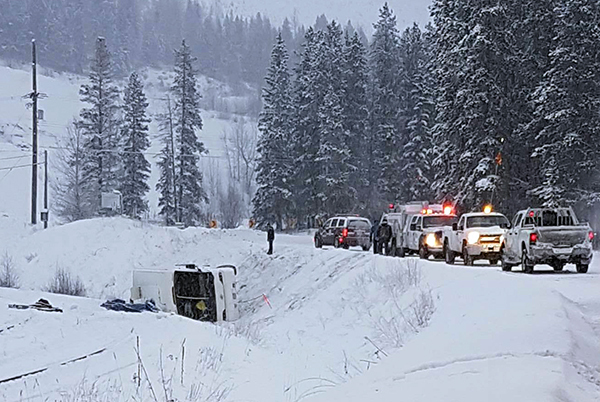 At least three workers from Teck Coal Ltd.’s Coal Mountain Operations were injured in a morning bus crash not far from the mine’s front gate (approximately 30 kilometres southeast of Sparwood) on December 10. “A bus transporting employees from our Coal Mountain Operations back to town with 12 passengers on board slid off the public road this morning,” reported Nic Milligan, Teck’s Manager, Community and Aboriginal Affairs. The Coal Mountain coach bus that crashed was the B.C. bus taking workers home at 7 a.m.